These Christmas ornaments are the perfect solution for hiding tiny Christmas gifts this year. Not just your ordinary Christmas decorations, these delightful keepsake quality ornaments are an excellent way to surprise that special someone with a tiny present or personal note this holiday season. Each colorful ornament is artfully hand painted and coated with an enamel finish to create an heirloom piece that is certain to be treasured for generations to come. 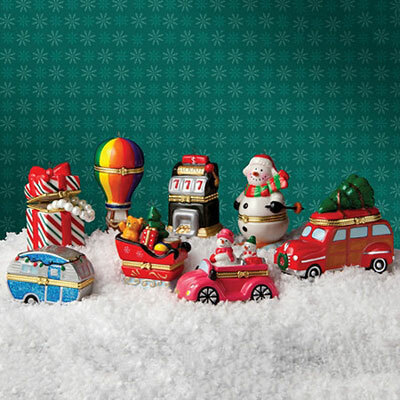 Choose from a variety of styles including a wistful Christmas ball, an angel, a Christmas cupcake, a stack of books, a candy cane, a Christmas tree, a cocktail shaker, a mug of cocoa, a convertible, a cookie jar, a gingerbread house and many more. Equipped with a golden cord and ready to hang on your loved one’s Christmas tree, these Christmas ornaments make wonderful Christmas gifts for coworkers and family members alike.